Osmon lights the oil lamps on the process of Molina’s creative wonder, from toddling on the shores of Lake Erie to the indie folk pedestal he so deservedly sits upon today. Chicago music/culture scribe staple Erin Osmon’s debut as a book writer is a touching, almost mythical glimpse into the posthumous genius of Jason Molina. The Songs: Ohia / Magnolia Electric Co. mastermind’s tale is a harrowing scope on the travails of one of America’s most tragically unsung folk rock heroes. 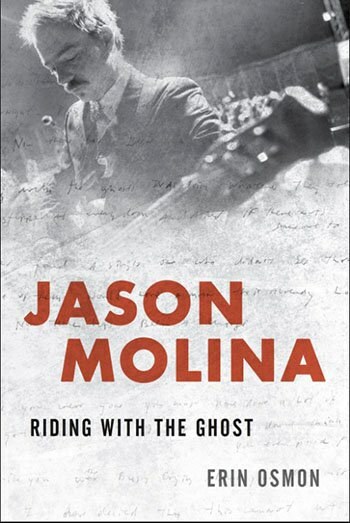 From his meager upbringing in a rural Ohio trailer park to his musical apexes, Jason Molina: Riding with the Ghost covers all at surface level, underneath, and in between. Pulling from interviews with family, friends, bandmates and fellow artists, Osmon has the ultimate of inside lanes in her inaugural pass on not just her first book, but undoubtedly the first biography on the interminable Molina. Never short on details, it’s a ravenous fan’s dream. Songs: Ohia and its lo-fi folk aesthetics were so special they birthed what is one of the foremost and thriving record labels to date in Bloomington, Indiana-based Secretly Canadian. Taking a chance on a whimsical, five-string guitar wielding former heavy metal bass player proved futile for both artist and label. Osmon lights the oil lamps on the process of Molina’s creative wonder from toddling on the shores of Lake Erie to the indie folk pedestal he so deservedly sits upon today. He was an all-star outsider who thrived in the arts and found his only solace behind wood and wire. His ominous yet soothing voice carried his lonesome poetry into the hearts of fans worldwide, broken as they may be. Molina’s odd alcoholic ways are addressed at length, from the first inclinations to his ultimate passing and the bewilderment and self-guilt it left with those who loved him. It's the old classic tale of an artist begat by his demons, or in this case, ghosts. Osmon provides the deepest of glimpses into Molina’s worlds. All the trinket-filled mysteries left behind by one of the greatest songwriters who ever wrote a note are captured here.